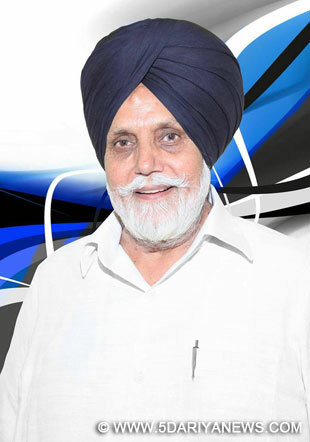 Janmeja Singh Sekhon, Defence Services Welfare Minister Punjab today gave a call to the people of Punjab to come forward to donate liberally on Armed forces Flag Day for the welfare of our Jawans who are protecting the frontiers of our country.In a message to people on the Armed Forces Flag Day Mr. Sekhon said that Punjab is the sword arm of the nation that has given befitting reply to the aggressor enemy in 1962, 1971 and Kargil aggression and it becomes our bounded duty to do our bit for the welfare of those forces that guard our frontiers day and night so that we could sleep peacefully. He said that thousands of Jawans had laid down their lives in the most and inhospitable terrains and it was imperative for the every citizen of the country to extend their helping hand to our protectors. Earlier in the Armed Forces Flag Day Ceremony at CMR the flag was pinned on to the Minister by Brig JS Arora, Director Defence Services Welfare, Punjab along with staff of the Directorate. The Minister also stressed upon the significance of the Flag Day and urged the citizens to donate generously for the noble cause. “Punjab is the leading state in taking care of the Valiant Ex-servicemen and their widows.” said Mr. Sekhon. It is pertinent to mention here that The Armed Forces Flag Day is celebrated all over India every year in order to collect the funds from the people all around the country for the wellbeing of the staff of the Indian Armed Forces.